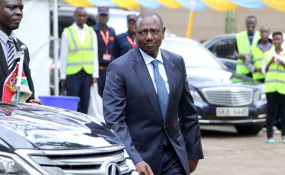 Deputy President William Ruto has called on African countries to continue accepting financial help from the West or China as long as it boosts infrastructure on the continent but doesn't lead to re-colonisation. In a lecture delivered at the UK's Warwick University on Saturday, Dr Ruto said African leaders must now steer their people to the ideologies of their founding fathers who vouched for Pan-Africanism that neither aligned to the East nor West. In the UK, where the Deputy President had scheduled a series of public speeches, he admitted that Africa's six decades of independence have mostly been on paper only. "While our lands are politically emancipated, our minds, imaginations and economies are yet to be completely decolonised," he said in a lecture delivered on his behalf by Manoah Esipisu, Kenya's High Commissioner to the UK. "Yet even after her political independence, Africa has been the stomping ground for economic and ideological control between the West and East." Mr Ruto spoke of Pan-Africanism, a clarion call initially made by former Ghanaian leader Kwame Nkrumah who had asked independent African leaders to "face forward." Yet, despite the end of colonialism more than 50 years ago, Mr Ruto admitted Africans are still facing the same type of problems as before independence, mostly because they are still controlled ideologically by former masters who advance "new forms of colonialism." "The emergence of China as an alternative to the false utopia advanced by unipolarity, has been an attractive allurement to many African nations, which view its role of supporting Africa's infrastructural development as a welcome departure from the West's approach of aid, paternalism and dependency. "Yet, if the continent were to heed Nkrumah's call, it must not fall for this Eastern economic mysticism either, but must instead, ground its relationship with either the East and the West on a pragmatic new Pan-Africanism. The Chinese have recently been Africa's rising creditors; advancing loans to build transportation and power transmission networks.